South Korea will increase the number of hydrogen-powered vehicles on the roads by 80,000 units in the next four years, the finance minister said Wednesday. Deputy Prime Minister and Minister for Economy and Finance Hong Nam-ki said at a ministerial meeting on innovation-led growth in Seoul that the new fuel-cell electric vehicle target is part of a broad strategy aimed at building an ecosystem for hydrogen industries. It would include producers of the fuel as well as technologies that store and transport the energy. The final plan on the government’s hydrogen drive is set to be announced Thursday at a meeting with the attendance of President Moon Jae-in, officials said. During the meeting, the government also unveiled a plan to promote artificial intelligence and a data economy by expanding the relevant market to a size worth 30 trillion won ($26.8 billion) by 2023, and creating AI hubs for big data centers and platforms. Seoul renewing its target of FCEVs comes amid growing competition among advanced countries vying to take the lead in hydrogen technology. “We have come up with a strategy that covers a wide range of hydrogen-related fields to secure the top position in the global markets of FCEVs and fuel cells,” Hong said. China has been pushing for the development of hydrogen technology with an aim to increase the number of FCEVs on the roads to 1 million by year 2030. The US, currently a leader in terms of the number of FCEVs distributed, plans 800,000 in the same period. Japan, meanwhile, plans to promote its hydrogen technology with the 2020 Tokyo Olympics as momentum. 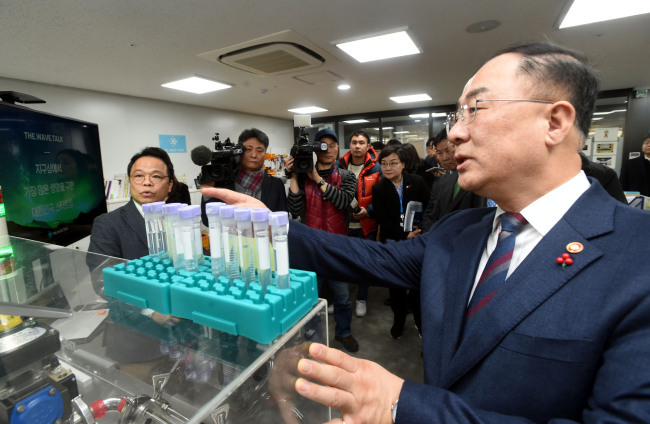 The South Korean government sees hydrogen technology as a fresh growth engine to boost its traditional industries such as automobiles, energy and infrastructure. Hydrogen is a rival technology to internal combustion engines and rechargeable batteries, but fits well into the government’s efforts in cutting emissions of greenhouse gases. South Korea leads fuel cell technology in the autos sector, although not in terms of infrastructure. Hyundai Motor’s latest FCEV Nexo can go 609 kilometers on a single charge, but a lack of refueling stations and energy companies’ reluctance to invest has been raising questions of its viability. The country has 2,000 FCEVs, including those registered as preorders. During the meeting, the Ministry of Science and ICT also announced its plan to promote AI and the data economy. The initiative is designed to activate collection, distribution and application of data. As the first step, the government said it will start building a massive data collection system and platforms to analyze big data across the nation from this year. Some 100 centers and 10 platforms will be eventually integrated by early 2020s. Such a data-based system could be applied to various sectors, such as transportation. Once massive data about roads and railways are gathered, they can be integrated with maps and closed-circuit footage for more solid infrastructure. The government also pledged to establish an efficient data distribution system to acquire massive data at lower costs and with less effort. For that purpose, the government said it would increase financial supports for small companies trying to purchase data. By 2023, the number of companies eligible for subsidies will increase to 8,000 from 1,640 this year, the government said. The government added it would foster the ecosystem of the “My Data” initiative, which aims to restore control of various personal data to individuals. The initiative involves creating a system of individuals directly approving the use of their data by businesses so that each of them can feel the benefits from sharing their information. The ministry said it will work on expanding the application to various industrial fields, including finance, telecommunications, energy and retail.